Over the past decade, the atmosphere has changed for hospital marketing professionals. Increased out-of-pocket health care costs have forced consumers to shop around where previously health care was determined by network availability. However, little has been done to adjust marketing offers to reflect the changing atmosphere of health care marketing which in turn has challenged health care marketers to better identify the number of new patients generated from marketing efforts and provide an effective marketing report for health care CEOs. Sophisticated health care consumers demand transparency, and to effectively reach new patients, hospitals must become a trusted resource for consumers. When health care marketers develop their content and relationship process as a trackable offer, an ROI calculation can be made to determine the exact financial return of a new initiative. For instance, an invitation to join a health care seminar can be measured by the number of people who receive or view the invitation versus the number of people who register and attend. A marketer can show the impact of the incentive (how many people registered) by comparing it with the overall impact of the campaign and can then determine the number of new patients generated from each marketing campaign. 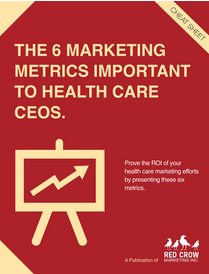 Track expenses related to health care marketing. Track the number of patients acquired per campaign. In the case of direct mail, use a special phone number. With online marketing, track leads generated and patient acquisition. Divide the campaign cost and the number of newly acquired patients. This determines the cost of acquiring new patients within the campaign. For example, if you spent $1,500 on an seminar and acquired 50 new patients, your cost per patient would be $75. Adjusting your health care marketing offers to a measurable format can help you better identify number of new patients generated from your marketing efforts. Then, you can use the average patient purchase history minus the cost to attract the new patient to determine the lifetime value of a new patient, reiterating the positive impact of your health care marketing efforts.